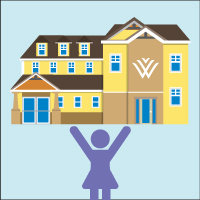 At each Wellspring centre, there is a specialized Family Counsellor who is trained to help families with respect to a parent’s illness with cancer. The Family Counsellor can provide you with short-term counselling to help you prepare for talking with your children, support your family’s unique needs and ensure that you have ongoing support for you and your children. Please call the centre at 905-257-1988 or send an email to the Centre Manager to book an appointment with a Family Counsellor. Once you appointment has been made, the Counsellor will contact you by telephone to ensure the service is best suited to your needs.